In the annals of SearchResearch history, there are sometimes tiny errors, sometimes huge blunders, and sometimes there are things that are small, but deeply annoying, and often repeat themselves. 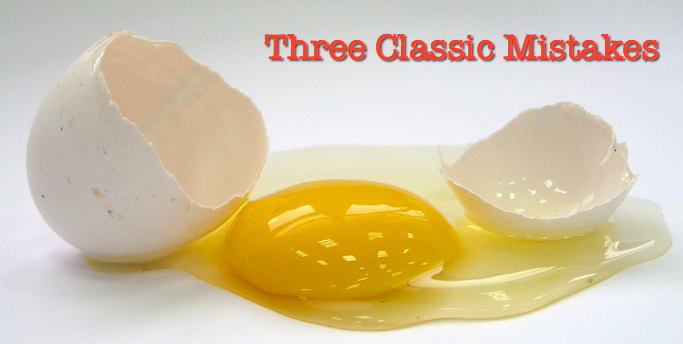 Here, today, are "Three Classic Mistakes" that I've made over the years. These aren't huge, but if you can learn from them and save yourself the hassle--so much the better. To answer these, please post what you think I did wrong in each case. What's your diagnosis, doctor? 1. My missing friend's article. I have a friend by the name of Sean Carlson. A former Googler, he now writes beautifully about Ireland and the experiences of an Irish transplant to America. One day last year he mentioned to me that he had an article published in the New York papers about being Irish and an immigrant. "That's fantastic!" I thought. About a month later I remembered that I wanted to read it, so I started checking the New York Times for his article. I did the obvious search: [ site:NYTimes.com Sean Carlson ] But much to my surprise, I couldn't find his article. I eventually found it by modifying my query, but what did I do wrong here? 3. A missing conversation with a friend. My third friend and I had a long conversation last night; back and forth we messaged each other to figure out what to do about a particular technical problem that came up. This morning, when I went to my Gmail to find the instant messaging thread, there was nothing there. Oh, I could open up the IM I sent to him and find some text, but I couldn't figure out where the long text of our conversation had gone. Do you have any idea about what could have happened here? Where can I find out longish back-and-forth conversation? Any ideas? So tell me: When you read these situations, what would you do? How did I solve each of these little search problems? What did I do wrong in each case? Let us know what YOU think I messed up. Answer: How are nuclear blast zones like choosing a good place to live? MY work sometimes intervenes. I try to write my SearchResearch posts early in the morning before anything else can worm its way onto my schedule, but I didn't succeed yesterday. I've got a deadline coming up on Monday, and well... you know how it goes. Yesterday turned into a longish day and so I didn't get around to posting the hint I'd meant to share with you. But here's the hint: Think geometrically. I know, how long would it have taken to write that down yesterday? (as Fred did) was an excellent move. Everyone who did some variation on that theme gets a gold star because I didn't think of it, and I should have. That's just great! To solve this problem, I started by searching out (as I hope you all did) the actual capitals of each of the states. I suspect that many people will get the Washington and Nevada capitals wrong. Check your initial data to be sure you're solving the right problem. Now my PLAN was to use a tool to just draw circles around each city, and then size them until I found a common meeting point. I quickly realized that the equidistant point was going to be somewhere around 400 miles away from each of the cities.... and I also realized that just fiddling with the radii wasn't a good strategy. As I was telling someone else about my solution, I realized that I was implicitly trying to find the center of a circle with four points. And--this is the key point--three points define a circle with a common radius. This was, in effect, a little remembrance of my old high school geometry. If three points lie on a circle, then the only point that is the same distance from all of them is in the center. Right? Let's call that distance r (for radius). A fourth point (say, a fourth city) that's NOT on the circle must be at some distance from the center of the circle that's NOT r distance away. Just a glance at the diagram above shows that there can't possibly be any circle that fits all four of these points. You can fit three, just not these four. So we have to think of a better solution than finding one point that's equidistant. What would that be? and that's when I found my calculator: Geographic Midpoint. And this map has (at the lower left) a nice set of options for determining HOW you want to define "midpoint." Do you want "Center of Gravity"? "Center of minimum distance"? "Average lat/long"? Here you can see I chose "Center of gravity," which is (I looked it up) the balance point of a figure that's defined by its shape. That's the blue dot above. We could have used the average of the lat/long (in effect, looking for the midpoint of the lines), or we could have computed the Centroid. But they all would be about the same, pointing to a location in southern Oregon. Of course, we could also have taken the lat/longs for each city, and computed the intersection of diagonals. For a roughly trapezoidal shape (as you see above), it wouldn't be that far off. I'll leave it as an exercise for the reader (who remembers high school geometry) to compute the intersection of the two lines. There's a big one here for me: This wasn't at all what I'd expected the answer to be! When I wrote it up, I figured it would be a simple process to take a Google Map and drop in a few circles, compute the distance, and be done with it. Moral for people who write questions (I'm looking at you, teachers! ), problems often are much more challenging that you first think. I'm really pleased that we found so many alternate solutions! I have to admit that I hadn't thought about the "How Far Can I Drive" aspect of the problem. But clearly, if you're going to live there, that's a great factor to consider. And I really hadn't dreamed that there would be a tool to compute this, although now I know about it. Excellent finds and analysis from everyone. Nicely done. And the last lesson, of course, has to be: You never know when geometry will be needed. 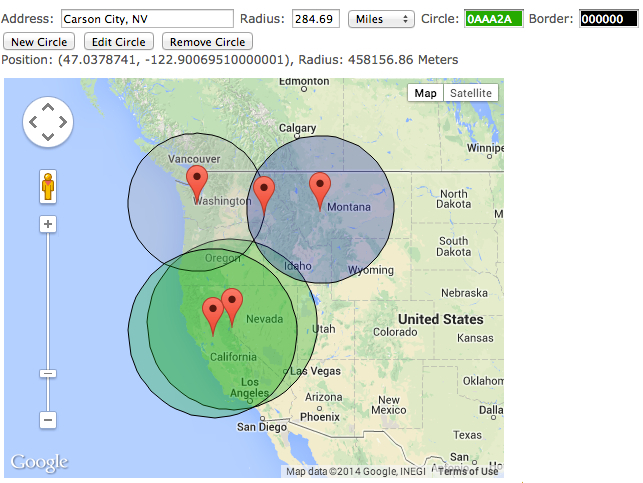 Wednesday Search Challenge (7/23/14): How are nuclear blast zones like choosing a good place to live? EVERY so often I get asked really interesting questions that I'm not sure how to answer. I have to pause and think about the question, and then come up with an approach that will answer it. Here's a question like that. It involves trying to figure out the best place to live between different locations. You can think about it as trying to find the place that's nice and quiet--and maximally far from big city centers (the "blast zones"). Or you can think of this question as trying to find a place that minimizes the distance you have to travel to the city centers. Obviously, there's not a simple query that's going to solve this for you. You'll have to step back and ask, "How CAN I solve this problem?" Hint: You're probably going to use a map... but how? I'll give another hint tomorrow (along with some thoughts about collections). For today, enjoy thinking about this research Challenge! Answer: What can you find out about this property? 2. The studio location is pretty large, and as you remember from last winter, it sometimes snows in the northeastern US. How can Cookie Monster get to work if the studio streets are snowed in? 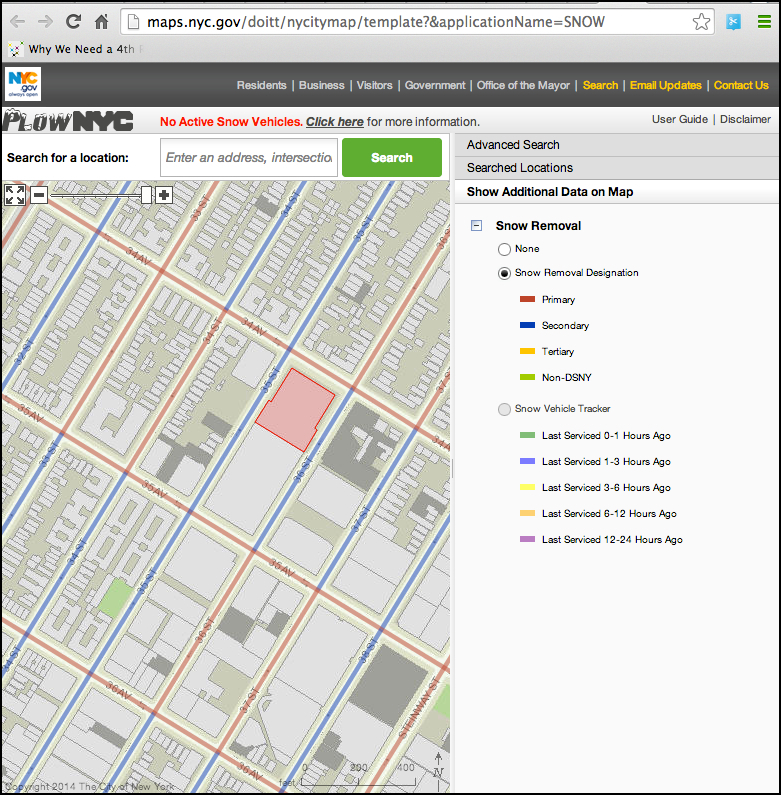 Can you find the snow removal status of the street(s) where the studio is located? 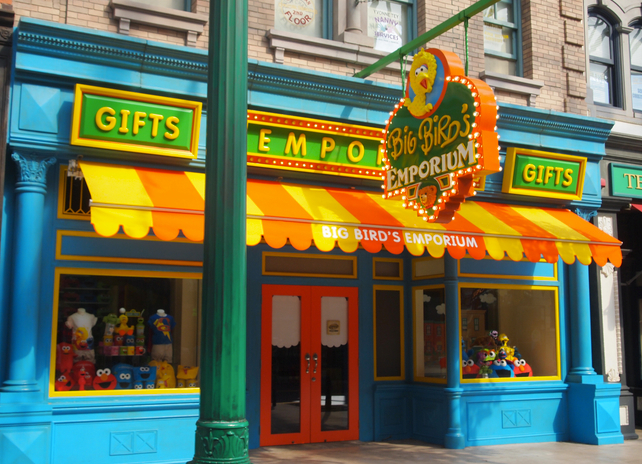 There's a fun article on the Muppet Wikia site that tries to work out where in NYC the "real" Sesame Street would be located (as suggested by clues given in the series), but the clues are inconsistent, so the "real" Sesame Street remains located in a vague dream-space where all good stories reside. But the second link in the results leads to the actual studio, which is the Kaufman Astoria Studios, at 34-12 36th Street, Astoria, NY 11106. It's true that Sesame Street began filming at Unitel Studios on 57th Street, but then moved to the Kaufman Astoria Studios in 1993, when they needed more space. Now to answer the second question requires a bit more sleuthing. The avenues around the studio are "primary" and the streets are "secondary." The characters should be able to get to work fairly easily, as long as they stay on the avenues. Note that you have to be a little careful to select the "Snow Removal Designation" and not the "Snow Vehicle Tracker," which only gives the last updated snow plow time. See the part of the URL that says "template?applicationName=SNOW"? That makes me wonder if there isn't a base map that is the "master map," and we're just looking at a particular view (that is, the "SNOW" view). So I just deleted that "template?applicationName=SNOW" from the URL and hit reload on the page. Look what it gave me! The underlying Master Map, which has all kind of options to search and view information about properties. Notice how this view (of the Kaufman Studios building) shows a sheet on the right with lots of information. Date of construction (1919), square footage (280,000 sq feet, est. ), police precinct (114), and so on. Interesting. 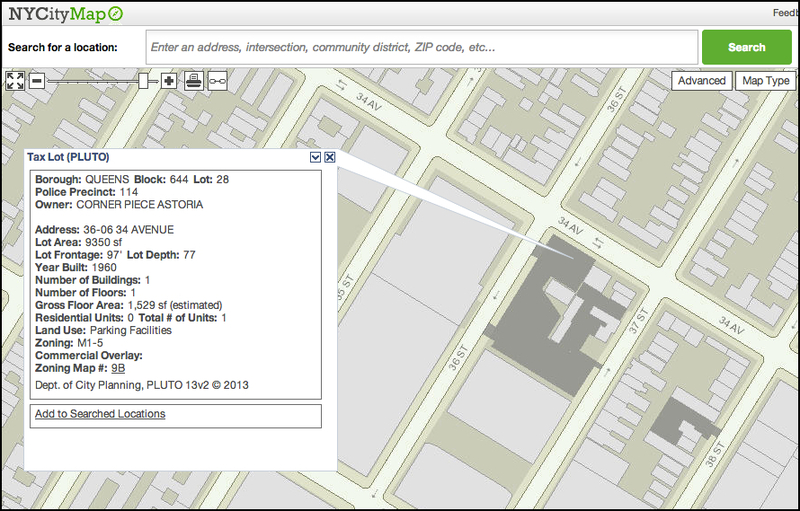 What's more, this is a clickable map--you can click on ANY building in NYC and get a lot of information quickly. 36-04 34th Avenue, Astoria, NY. Interesting. It's owned by "Corner Piece Astoria" (which sounds suspiciously like a company that was set up to buy, own, and hold just one piece of property). That makes me think that it might be mentioned in a public announcement somewhere. My idea is to find places in the news, or in public filings, where this land purchase might have been mentioned. And sure enough, I discovered in a press release that in 2010, "purchase of a 9,600-square-foot parcel at 36-06 34th Avenue in Astoria, Queens. The parcel is across the street from the landmark Kaufman Astoria Studios." It took one more click to yet another press release to find that Thomas D. Kearns and Hyman Kindler (attorneys for of Olshan Grundman Frome Rosenzweig and Wolosky LLP) represented the buyer, Corner Piece Astoria LLC. 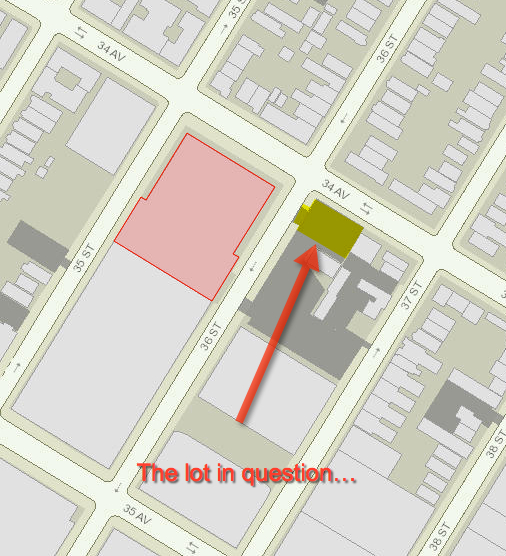 In the press release the empty lot is described as "A prime 9,600-square-foot irregularly-shaped parcel, offering 48,000 square feet buildable, located along 34th Avenue in the Long Island City area of Queens, has just been acquired by Corner Piece Astoria LLC for $3 million." But what was so interesting was the other little tidbit in that press release. “Several underground gas tanks were removed and subsurface oil was remediated in accordance with applicable laws during the three years since we introduced these parties in order for the deal to finally close,” explained Mr. Schechtman who added that in an unusual twist, this work was done by the buyer prior to closing." Okay, so why would a buyer need to remove underground tanks and remediate subsurface oil? Big lesson: When you're using a new tool for the first time, take a few seconds to look around and see what's possible to do. ALWAYS do this the first time--even 30 seconds will help--because you almost never do this the second time you use a new UI or database. 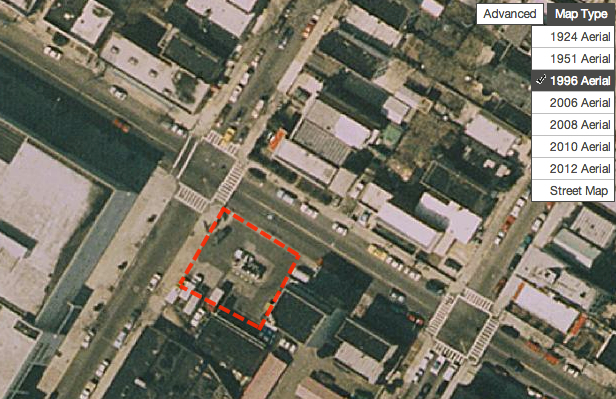 Here I've highlighted the property in question in the red-dashed box. But where did I get this image from? 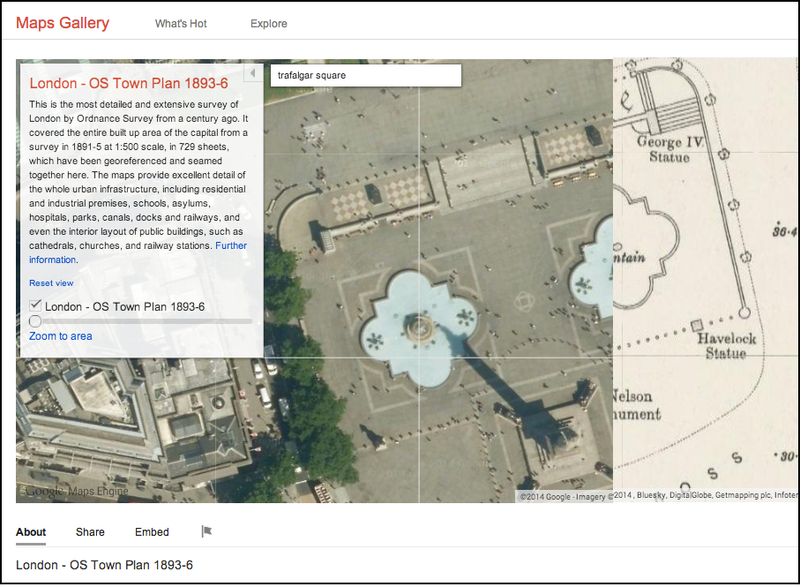 A: These aerial images from earlier times are hidden under the "Map Types" clickable item in the upper right of the map viewer. That's handy, because now we can see what this looked like in 1996. Let's check out this place in Streetview. The top image is the way it looked in Sept, 2013, and the bottom one is in Sept, 2007. I went back to 2007 to find out what the earliest image might tell us. You can see the concrete pads where the pumps once were, and the pads that are covering the underground gas tanks. The building in the back sure looks like a gas station. I can't quite read the signs, but it seems to be advertising Brakes, and Lube... that kind of thing. But just on a lark, I also checked out the Streetview from 2007. THIS is much better; it not only tells us what it was, but also the name of the last owner. 1. Pay Attention to the UI when you first run across it. On first encounter, you'll often see things and notice options that you'll ignore (or worse, not ever notice again) on the second and third times. Take a second, click on those buttons and see what's there. (You never know when it'll be useful.) PAY ATTENTION! 2. Going to the oldest image in the set might not give you the answer. In this case, looking at the image in the middle (from 2007) gave us a much higher resolution image than the current image (which has the sign removed) or the oldest one (which is too blurry to be read). 3. Watch the URL for clues about what else is possible. This doesn't happen all the time, but every so often the URL will reveal details about the information architecture. In this case, the "application" and "view" parts of the URL suggested that there was more available, if only you knew how to find it. That last lesson is a little advanced, but now you're attuned and can keep an eye out for it. You never know when you'll discover something incredibly useful. I was planning on writing up something about the topic of collections--but I got too many great suggestions about what to do WRT collections, so it's taking me longer than I thought, so I'll get to that next week. How did I do this? Easy. You can do the same kind of thing in Maps. Switch to Earth mode (by clicking on the Earth button in the lower left), then use the Tilt View icon to move the view. 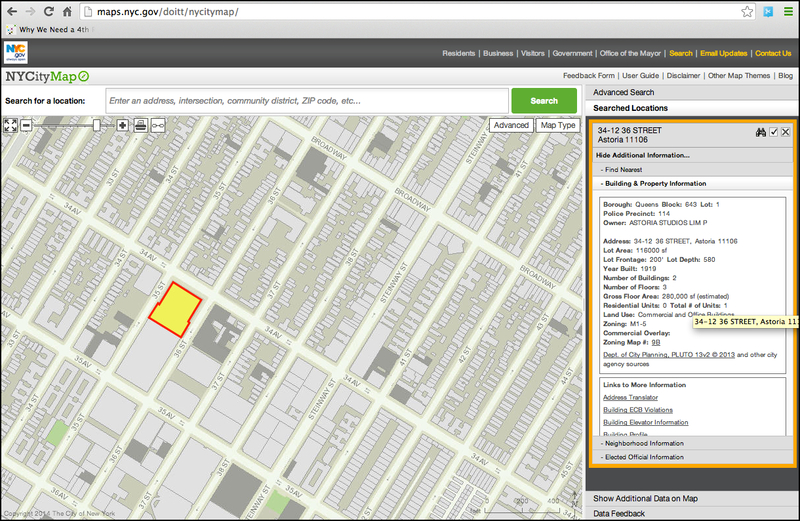 Wednesday search challenge (July 16, 2014): What can you find out about this property? In my opinion, one of the very best developments in all of the entire history of television is Sesame Street. A real set of an imaginary building set in a real building... But where's the real building? They have managed to figure out what works to teach kids all kinds of things. Silly, funny, fun, and deeply educational, they have a huge output, with everything from celebrity sing-alongs (Paul Simon singing "Me and Julio"), to parodies of famous stories ("Lord of the Crumbs," a send-up of "Lord of the Rings" with the memorable line "One dessert to rule them all..."). Of course, they're best known for their teaching videos. My favorite is still "Three is a magic number" but it's hard to choose just one favorite from the entire set. BUT... the question is really this: How does one place manage to produce so much magic? The point of this particular Challenge is to see if you can figure out HOW to figure out the answers. This is slightly harder than some, but straight-forward if you remember what rules of thumb we've covered. Trust me--it's not as crazy hard as it sounds. Answer: Where's the statue now? In this week's Challenge I was wondering about a statue that USED to be between two fountains in a well-known public square in London that was once-upon-a-time trafficked by Straight-Tusked elephants. 1. Whose statue am I describing? 2. What square was it originally located in? To solve the Challenge, I started with the clues about the Straight-tusked elephant. First, what IS a Straight-tusked elephant? tells you it’s Trafalgar Square (Natural History Museum's blogpost and a paper about "Interglacial Deposits at Trafalgar Square" published in New Phytologist 59.2 (1960): 145-152). then turning to the Wikipedia article about Trafalgar statues, or looking at the UK Trafalgar page. I hadn't realized it when I wrote this Challenge that the Wikipedia page would say: "The other, of General Charles George Gordon by Hamo Thornycroft, was erected on an 18-foot high pedestal between the two fountains in 1888. It was removed in 1943 and re-sited on the Victoria Embankment ten years later." And then provide a link to a 1976 book about the Square's statues. So it should be straightforward to read the Wikipedia article General Gordon and find the statue. BUT... it's harder than you think. The Wiki article says it's on the Victoria Embankment. But if you look at Maps.Google.com for the Victoria Embankment, you'll find a nice, relatively small park on the Thames with many statues. None of which are of General Gordon. which is consistent with the descriptions of the statue when it was in Trafalgar Square. This is the statue by Thornycroft, but where? If that's the current location of the statue, it's clearly NOT in the Victoria Embankment Park. When I use Streetview to check out the Embarkment park, it's either leafy green, or a view of the river Thames, or other office buildings with Doric columns and other kinds of edifices. This building in the back of the statue shown above doesn't match! So where IS this statue? I thought to search for a tool to help me locate monuments and statues in London. But after a few minutes of looking at all of the statues in the Victoria Embankment Park, I realized that it's not there... the database is incomplete. Luckily, they have a database search function (so I don't have to poke one-by-one at all of the pins on the map). I searched for [ General Gordon ] and [ General George Gordon ] and [ Gordon ] ... but there's no statue! Dead end. Could it have been moved since the last document I found? I went back to the Wikimedia source page for the image, and read carefully. I learned that the source of the image was the Geograph website, a British project to "photograph every grid square" (of the Ordnance Survey grid). General Gordon statue looking out over the Thames. Near, but not in, Victoria Embankment Gardens. Clearly the same statue. Not in the LondonRemembers database, but handily located by tracking back to the original source of the picture. 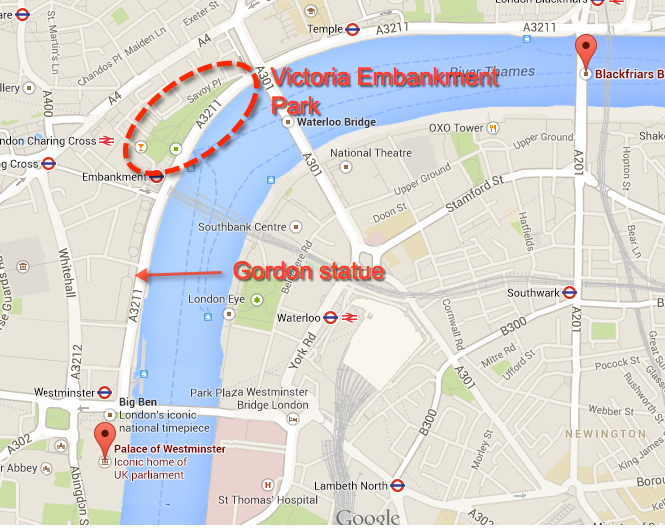 It turns out that the statue is in the area known as the Embankment, and not in the "Victoria Embankment Garden" area. Just for clarity, I went and looked up "Victoria Embankment" just to see how others defined it. Turns out that "Victoria Embankment" is "...is part of the Thames Embankment, a road and river-walk along the north bank of the River Thames in London. It runs from the Palace of Westminster to Blackfriars Bridge in the City of London." 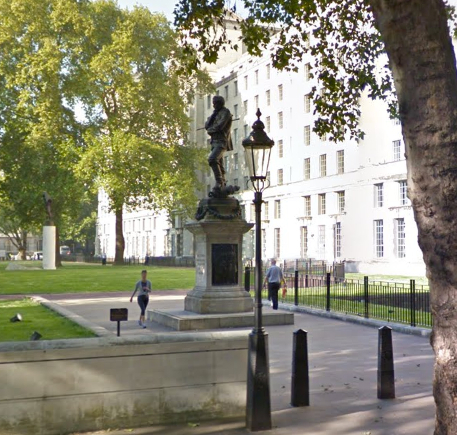 So the statue really IS in the Victoria Embankment, and not in the Victoria Embankment Park. As I said, this is a fine solution--but not what I was expecting everyone to do. 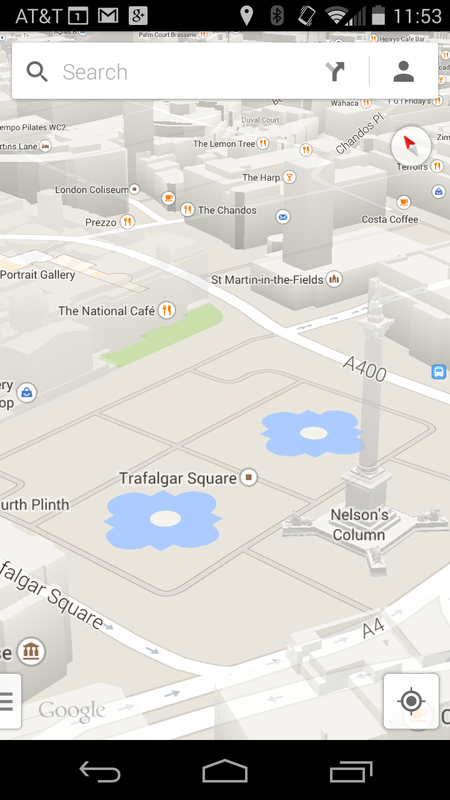 My solution: Instead, my first solution to figure out what was at the center of Trafalgar Square (and between the fountains) was to seek out an old map of Trafalgar Square! 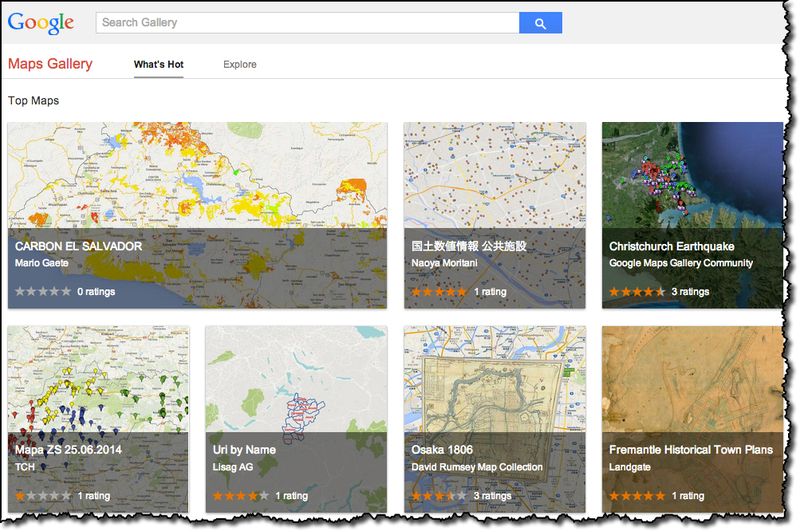 I know that a great collection of online maps is at the Google Maps Gallery, so I started there. There are roughly 1000 maps (I don't know the exact number, but it's growing). That's a decent resource, and well worth a quick search. It was then pretty simple to find the map of London in the 1890s. 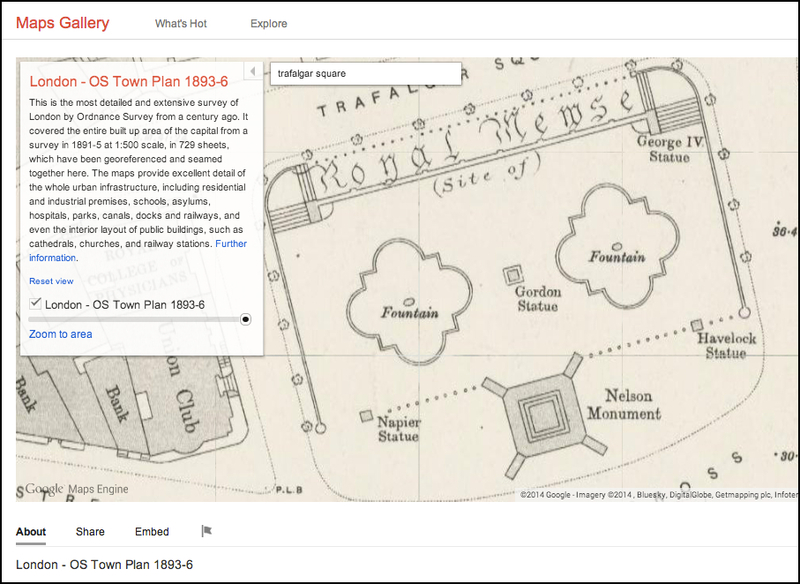 Here's the OS map from 1893 of Trafalgar Square, centered on the place I was asking about... and you can see that this is where the "Gordon Statue" was originally placed. I want to point out a subtle feature about these kinds of maps--notice the slider (marked in red above). This allows you to shift the transparency of the overlap map. In the image below, I've tried to show the effect of switching from the current view (shown on the left) with the map (shown on the right). Try it yourself on the Maps! You can see that there's a blank spot where George Gordon once stood. Search lessons: First, as always, check the answer you find. Although many sources say "Victoria Embankment," it's actually in the AREA known as the Victoria Embankment, and NOT in "Victoria Embankment Park," which you'd first think. Tracking down the exact placement of the statue required a bit of working backwards to the original source of the data (in this case, the picture) and figuring out where that source said it was. The lat/long from the original publisher turned out to be correct. Also, not all databases are complete. 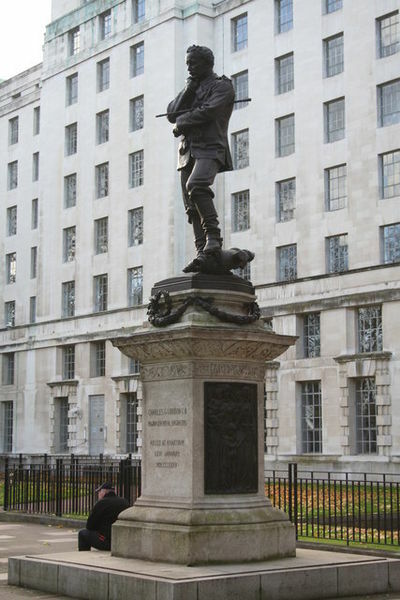 Although the LondonRemembers database is a great resource, it just happens to be missing this one statue. Finally, remember that there are great collections of resources that you need to keep in mind. This is why I asked about your favorite collections. It's not always obvious which kind of document (or which kind of collection) you need to search in order to find the answer. In this case, I knew that the Maps Gallery had a lot of historical maps. Luckily, a map of exactly this time period (when Gordon WAS in Trafalgar Square) was in the collection, and so it was easy to see where he stood. I'll write a bit more next week about collections and how much you need to know about them. While Google does a great job of search, there is still some stuff you've just got to know. This business about collections--what they're called, how their organized, how their indexed, and what kinds of things they collect--is still something you need to have quickly at hand. 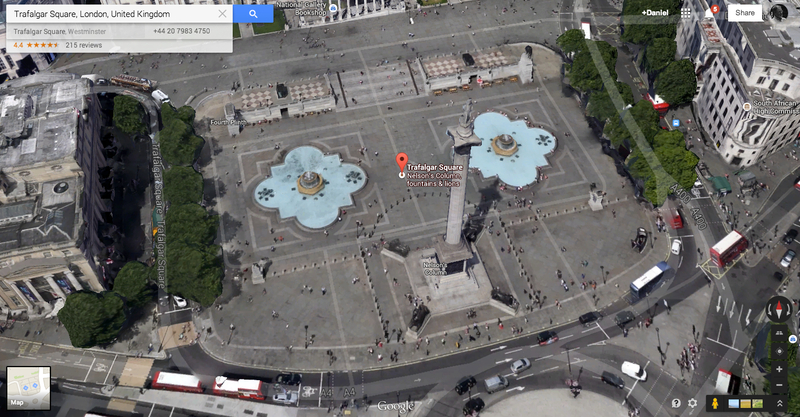 Wednesday Search Research Challenge (July 9, 2014): Where's the statue now? I'm traveling (again) this week, working in a city with a majestic river, one storied in song and legend, and occupied for at least 2,000 years. And this prompts me to ask a very specific kind of Challenge. I'd been reading about the megafauna of the last Ice Age, and was surprised to find that bones of the straight-tusked elephant had been found not far from where I'm at. They were discovered while doing some construction on a large square near Charing Cross. 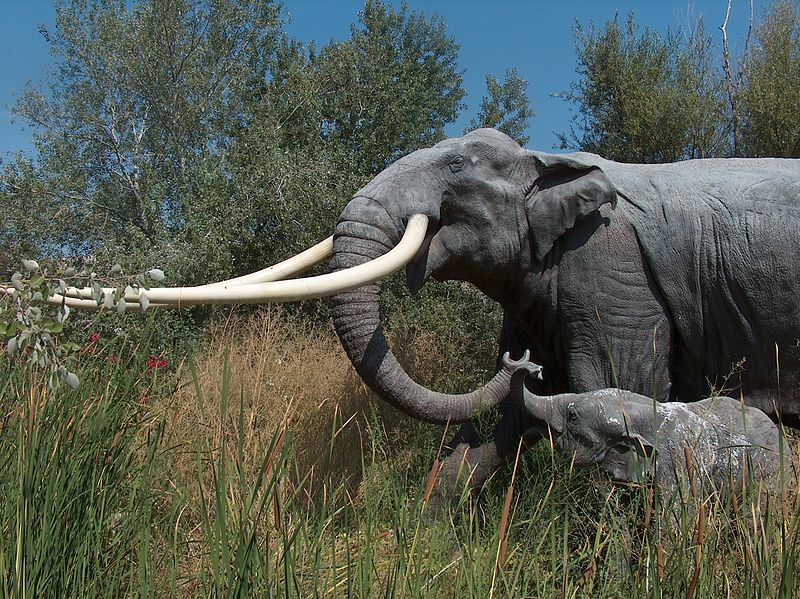 Diorama of the straight-tusked elephant. From Wikimedia, created by Apotea. Please let us know HOW you found the answer to this week's challenge, and if you used any specific content to discover it. A separate question: What kinds of collections of content do you find most valuable to use in your own search challenges If enough people reply, I'll collate the answers together and let you know what we think! Personally, I find collections of maps to be incredibly useful. But what collections of content do YOU like to use? Answer: Why could I run on water? Can you help me figure out what happened here? 1. How is it possible that, while running on the beach, I seem to have run on the water? What is a non-supernatural explanation for this? 3. While running in the park I noticed that the ground I was running on was not quite what I expected. What kind of ground was I running on? you'll find the Map Engine (at https://mapsengine.google.com/map/ ). 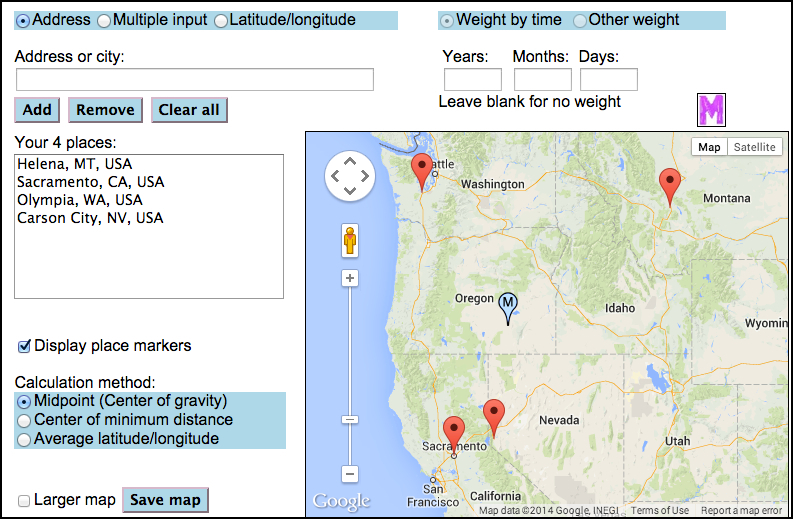 This is a tool Google makes that lets you create your own map. Using this, I tried to duplicate the map from above. Here's my (slightly simplified) map. Note that you can change the "base map" by clicking on the down-arrow (to the right of the Base map menu item). Here I change it to "satellite view" (the second item in the top row of options). My path took me out onto the sand... at low tide. The edge of the water is marked on the map at "mean high water" (sometimes called "average high tide") since that's the more-or-less conventional place to mark the edge of the sea on maps. So it's not that hard. Just use the right tool, and look at the different views. Now in truth, we got lucky. 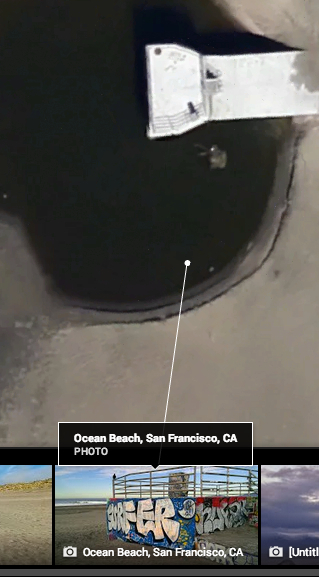 The image on the satellite view HAPPENED to be at low tide. Here, just for comparison, I put the Bing satellite view and the Google satellite view top/bottom. So it's useful to know about multiple, different versions of the same data (or imagery). Contrasts between them often reveal useful differences. If you create a close-enough copy of my running route using Google Maps Engine, you'll see a path editor, which will ALSO give you the distance. or I could have asked for it in kph, but this was just handy. Let's figure out what the ground surface is made of. How would we do that? One way would be to read the original garden design and see what the plan was. There's a nice summary in the Wikipedia article on Golden Gate Park, which points out that in 1860s, "Golden Gate Park was carved out of unpromising sand and shore dunes that were known as the Outside Lands, in an unincorporated area west of San Francisco’s then-current borders." The best image I could find (by searching for [ archival images Golden Gate Park ] ) is this one that illustrates what the park looked like BEFORE all of the planting. I did this to validate what I'd read about the park being made over sand dunes. Looks like those claims are correct. 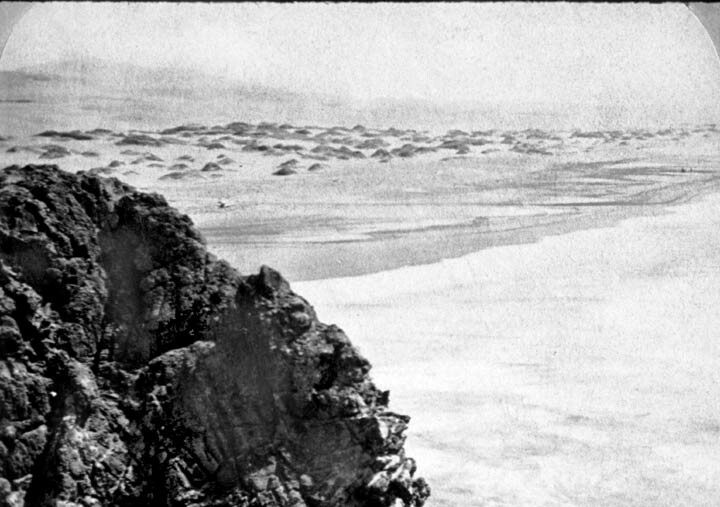 This is from the north end of the park area (Seal Rocks) looking south towards the area that would become Golden Gate Park. As you can tell, it's all sand as far as the eye can see. This is the substrate on which Golden Gate Park is formed... it's sand everywhere, and the sand comes up into the trails, which is what I was running over. The sand is obvious where the trail crosses the Great America Highway (near the windmill)--it's ALL sand there. But even at 25th Street (where I started), it's all rocky (which was put there to stabilize the sand), and at the Sunset Blvd crossing, you can see it's all sand there under the shade. Earth view from straight overhead. Note the large pool around the structure. Same location, but this time in an Earth view, tipped and rotated to see the front. Note the grate. From a nearby photosphere. Note the grate. Another view of the structure. Someone has changed the background color on "Surfer." 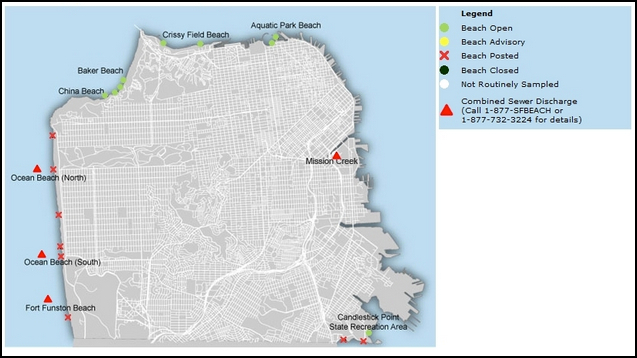 And in there I found a hyperlocal newspaper: The "Ocean Beach Bulletin" which published this diagram in an article about beach closings. This diagram labels our mystery structure as the "Ocean Beach (North) combined sewer discharge." large outfall structures on Ocean Beach." There you have it: the structure (with its large grate, and periodic appearance of a pool in front of it) is an overflow valve for the combined sewer/storm drainage system on the western side of the city. The good news is that this happens rarely, but when it does, the Ocean Beach is closed to swimming and surfing. The bad news is that the beaches close because the overflow is running onto the beach. As we've discovered before, having the right tool really helps. Learn about Google Maps Engine--it's incredibly handy (and we only touched the surface of what it can do). Second, when you want to figure out what something in the real world is like, nothing beats going and looking for yourself. 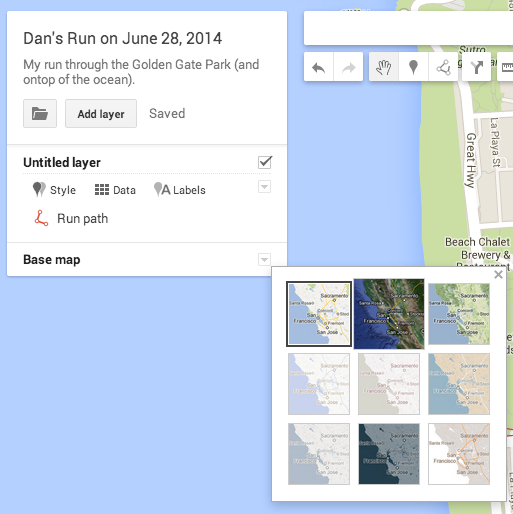 If you can't get there, then tools like StreetView, Maps, and Earth are your best friends. You can actually LOOK at something, and not have to take someone else's word for it. Finally, searching for "hyperlocal" news sources can often solve your hyperlocal question, or at least provide a great resource that gives you additional search terminology to refine your search. Answer: What do these cameras do?